There is a new king in the advertising world. In a press release issued yesterday, the Interactive Advertising Bureau (IAB) stated that the U.S. interactive advertising revenues for 2013 hit an all-time high of $42.8 billion, exceeding broadcast television advertising revenues ($40.1 billion) for the first time ever. This momentous figure marks an increase of 17 percent from 2012’s landmark revenues of $36.6 billion. For the third year in a row, mobile achieved triple-digit growth year-over-year, rising to $7.1 billion during full year 2013, a 110 percent boost from the prior year total of $3.4 billion. 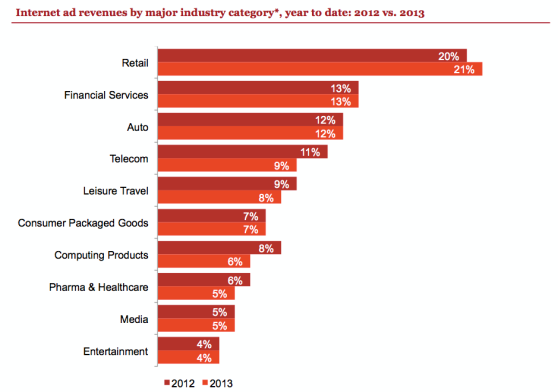 Mobile accounted for 17 percent of 2013 revenues, whereas it was 9 percent of revenues in 2012. Digital video, a component of display-related advertising, brought in $2.8 billion in full year 2013, up 19 percent over revenues of $2.3 billion in 2012. As a result, it also increased its share to become the fourth largest format, directly behind mobile. Search revenues totaled $18.4 billion in 2013, up 9 percent from 2012, when search totaled $16.9 billion. 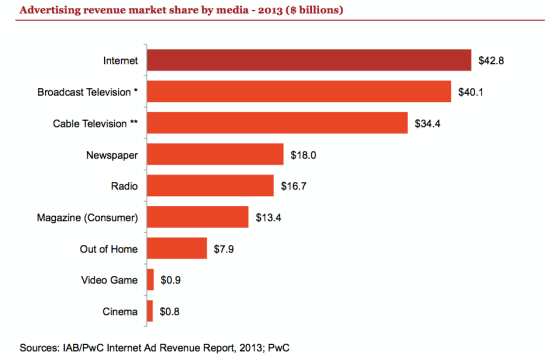 Display-related advertising revenues in 2013 totaled $12.8 billion or 30 percent of the year’s revenues, a rise of 7 percent over $12 billion in 2012. Retail advertisers continue to represent the largest category of internet ad spending, responsible for 21 percent in 2013, followed by financial services and closely trailed by automotive which account for 13 and 12 percent of the year’s revenues respectively. When looking at which digital ad formats are growing, search is still king with over 40% of all digital ads. But mobile ads are exploding and nearly doubled in volume from 2012 to 2013. Digital advertisements will only increase in the future as they provide an abundance of targeting options that are simply not available to other sources. Plus, unlike traditional media sources like TV or radio, their financial barriers to entry are much lower, thus allowing smaller businesses to participate.